An excellent resourse for any bible student. Compiled over 100 years ago, Strong's is a concordance of the King James Version. It lists each word in alphabetical order and it's location, along with the phrase in which it appears, to help you locate specific verses. After each entry there is a number which references the reader to the corresponding Hebrew or Greek word in the dictionaries in the back of the book. Look up all of the occurrences of a specific word such as "soul" and you might be suprised by it's usage, did you know the word "soul" is used to describe animals as well as humans, and that "souls" can die, feel hunger, thirst, etc.? Psalms 110:1 contains the phrase "the LORD said unto my Lord". Who is talking to whom? Why is the word LORD capitalized with all caps most of the time in the OT, but sometimes only the L is capitalized? By looking up the word "Lord" and checking the reference to the Hebrew dictionary in the back of the concordance, you find that whenever the word "LORD" or "GOD" appears in all caps in the OT, it denotes that the original word used there is not the hebrew word for 'lord' or 'god' but is instead substituting for the divine name, represented by the 4 hebrew letters YHWH ("Jehovah" in King James english, no vowels, the Y sounds like J, the W like V) Look "Jehovah" up and you see it's in the KJV 4 times, why not the other 6 or 7 thousand times? Interesting stuff. A great reference book to enjoy and learn. I really enjoy using this concordance. I can look up scripture concerning any subject without having to take someone's word for it. You don't need a scholar to tell where scripture is located or to tell you what they think it says and have you believe them. The wealth of knowledge and quick reference is infinite. Thanks. Great concordance that uses the original meanings. Good for first timers. This is a great concordance. Some of the newer concordances don't keep the original meanings for the words, they add meanings which they have decided belong there, which makes them unreliable. This concordance keeps the original meanings to all the words. It also has instructions in the front which are easy to understand and learn how to use a concordance. It is large, but it is easy to find what you're looking for as well. Glad I bought it! This is one of the best tools one can use to help in Bible Studies. 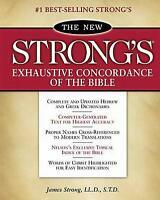 Every word found in the Bible is able to be found through the use of Strong's Concordance. It give how often word is used and the orginal meanings in the Gk. or Hb. language. This book can be useful to all ages of individuals from youth to adult.